The mood turned playful when Norwegian Foreign Minister Ine Eriksen Søreide joined in for a selfie with her colleague Nicolai Astrup on an unusually warm Friday afternoon in Oslo. They mostly had serious issues on their minds, though, during a meeting with foreign correspondents in the Norwegian capital. “There’s a lot of uncertainty right now,” Søreide said, just before also referring to rising “instability and insecurity.” Her message was clear: While she has a new emphasis on doing what’s in Norway’s own best interests, she’s still very keen on multilateral cooperation, especially with Europe. 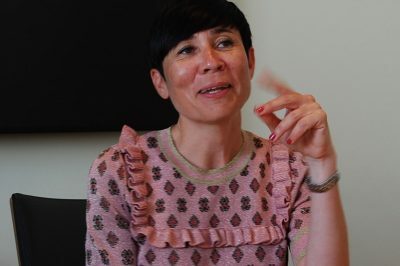 “We always say that Norwegian foreign policy starts in Europe,” Søreide said. Two weeks ago she released her ministry’s new EU strategy report. It clearly puts “Norway first,” in terms of stressing that all policy and goals are aimed first and foremost at serving Norway’s own needs and interests. Søreide, speaking directly and without notes, also stressed looming efforts to “strengthen multilateral systems” that the conservative Norwegian government coalition worries are “under pressure these days.” She was referring to organizations like the WTO, OECD and the UN: “It’s much better when nations are cooperating,” and not going back to the days of the superpowers. “It’s all about the values that bind us together,” she said. That’s part of her strategy for how she and the rest of the government is dealing with the unpredictable US President Donald Trump. Multilateralism may not appeal much to the man who insists much more loudly on putting “America first” and getting his own way, but it’s all the more reason for small and medium-sized countries like Norway to stick together. Søreide’s party has long wanted Norway to join the EU: After Norwegians twice voted against EU membership, cooperation with Europe and strong multilateral organizations are the next best thing. The most important thing, to Søreide, is “to ensure we don’t backtrack.” Key multilateral organizations have been carefully built up over the past 70 years. Her “biggest concern,” Søreide said, is to make sure they’re not dismantled or sidelined. As for the unpredictability of the often belligerent man in the White House, whom Søreide and Solberg visited in January, Søreide suggested it was important “to watch what they (US politicians and bureaucrats) are doing, and not just saying,” and get beyond the Twitter feeds. “Unlike what many think, there are many areas where things are much the same in the Norwegian-US relation,” she claimed, including security and defense policy. “But we do disagree, and we’ve been clear about that,” Søreide said, specifically pointing to the US’ decision to move its embassy in Israel from Tel Aviv to Jerusalem (Norwegian officials stayed away from recent ceremonies marking the occasion) and Norway has objected strongly to Trump’s new punitive customs duties on steel and aluminum. Norway was not happy when Trump pulled out of the climate pact agreed in Paris, and, most recently, out of the Iran Nuclear Deal. Norway still backs it, along with France, Germany, Russian and China, and is also objecting to looming US sanctions on Iran that can also hurt the US’ own allies. She contends Norway still has “full contact on both sides of the aisle” in the US Congress, and although the US Secretary of State Rex Tillerson whom she met earlier this year is gone, efforts will go on to work with the US even as its leader seems to work against everyone else. There were, for example, no promises this week, when Norway’s trade minister visited US Commerce Secretary Wilbur Ross in Washington, that the US will exempt Norway from its new punitive customs duties on steel and aluminum. They can hurt Norway’s own exports to the EU. Now Trump also threatens to put the brakes on Europe’s automobile industry as well, which also can hurt Norwegian firms that export car parts to large European carmakers. “We’re changing our tone quite dramatically,” Søreide insisted, despite criticism from opposition parties in Parliament (after she presented her mid-year report on relations with the EU in Parliament this week) that the government is “too passive” regarding Norway’s own trade agreement with the EU. Søreide doesn’t want to jeopardize it in any way, by initiating any renegotiation. At a time when conflict is becoming more common than cooperation, she says Norway wants to play a role in promoting the latter, while working with other nations to prepare for crises.